A watercolour depicting the royal party on the dais under the baldacchino, at the crossing of the Crystal Palace, with Prince Albert standing at the head of the Commissioners, reading their report to the Queen. The verso is inscribed with the title, date and artist. 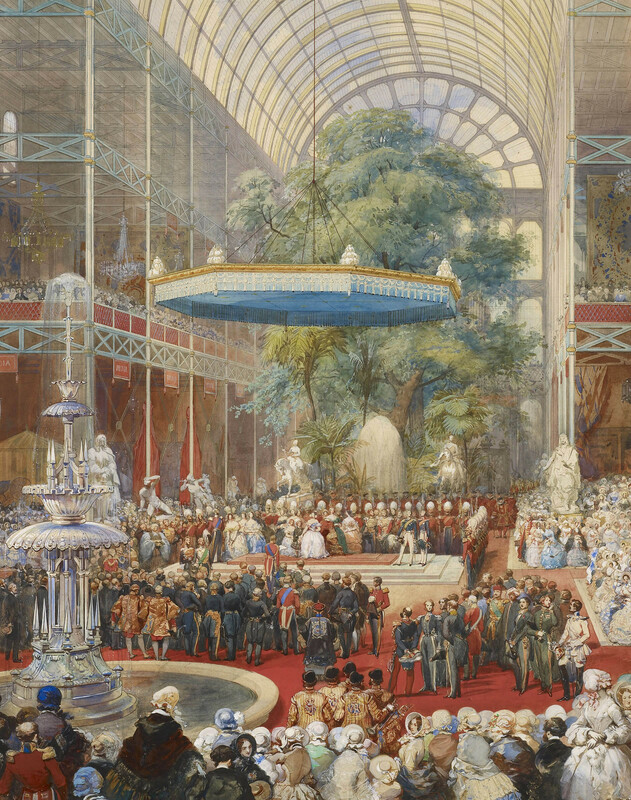 The opening of the Great Exhibition of the Works of Industry of All Nations took place on 1 May 1851.On a raised dais in the central crossing of the Crystal Palace, built in Hyde Park and enclosing several of the park’s mature trees, the Queen received the report of the Commissioners, led by Prince Albert. The Queen described the day as ‘one of the greatest and most glorious days of our lives’.